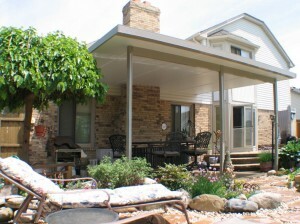 A patio cover is an excellent investment for homeowners in Albuquerque, New Mexico, and the surrounding areas. This is especially true because the ever-frequent bright sun is a frequent nuisance that can ruin any backyard barbeque or social gathering. However, with a patio cover in place this will no longer be a problem. It is important to select a patio cover that is made out of 4-inch thick aluminum because it is thicker and more durable than a traditional wood cover. And, should your needs ever change, a patio cover can easily be converted into a full room enclosure or sunroom down the road. For more information about the patio cover options we offer to homeowners in Albuquerque, NM, and the surrounding communities, contact ABC Seamless of Albuquerque today.